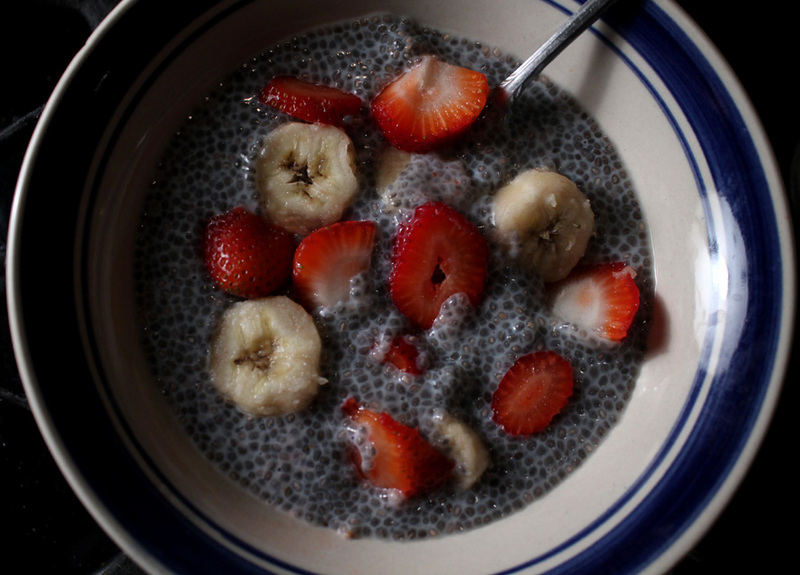 1/2 cup Chia seeds, 3 cups soy milk, 4 hours refrigeration, equals creamy Chia Pudding. 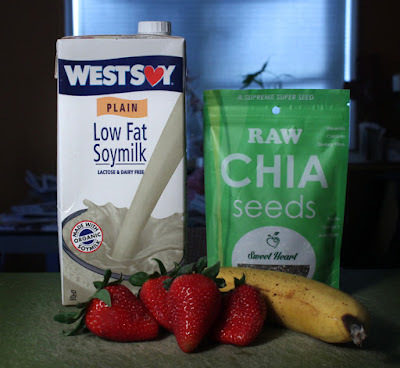 I've been seeing a lot of Chia seed mentions around the blogosphere lately, and decided to try a recipe to see what it's all about. I made a simple Chia Pudding with Fruit. 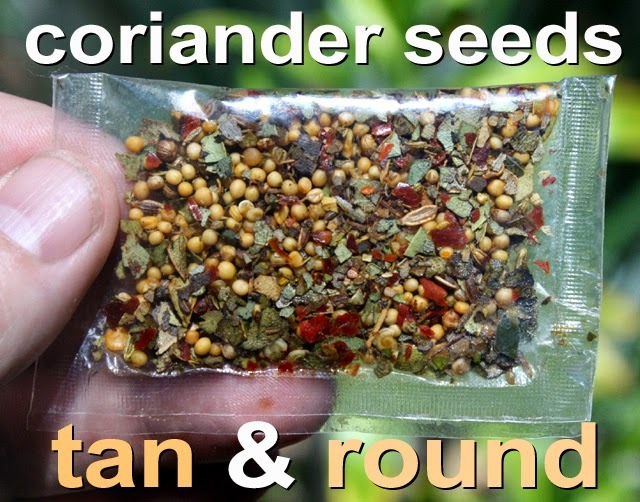 They are quite expensive at regular markets, but when I saw small 3 ounce packages in my local 99c only Store I picked up a package decided to try a recipe with the teeny tiny seeds. The small packages are located by the spices and dried herbs at the store I went to. Chia seeds are touted as a superfood with health benefits and extra nutritional value. You can read all about that stuff by clicking here. 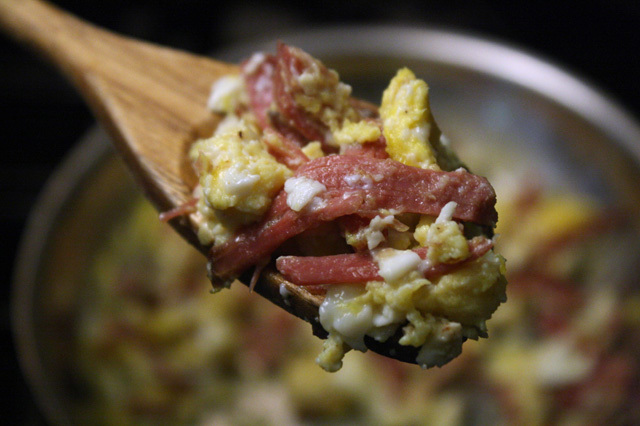 Mainly they are loaded with antioxidants and omega-3 fatty acids. Hey, I can use all the help I can get - I'm not getting any younger here. Chia, native to central and southern Mexico and Guatemala, is a species of flowering plant in the mint family, and has been cultivated by the Aztecs and Mayans way back in pre-Columbian times. What's interesting about them is when added to a tasty fluid they swell, absorbing the liquid, becoming similar to a tapioca pudding after setting for about 4 hours. 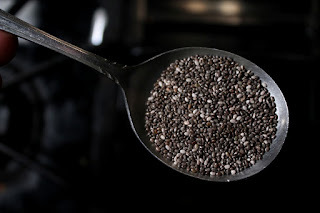 The taste of Chia is fairly neutral, maybe with a slight green tea flavor, so using a rich tasting liquid like almond or soy milk is recommended. If you think of it like oatmeal, then all you need to do is add some sliced fruit and you have a knock-out dessert or nutritious breakfast. 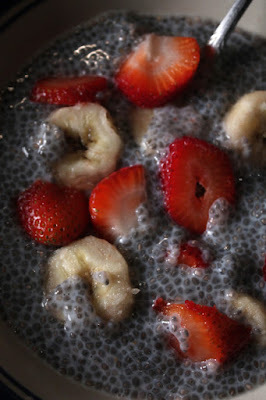 For my recipe I stirred in sliced strawberries and banana, after the Chia Pudding has set. 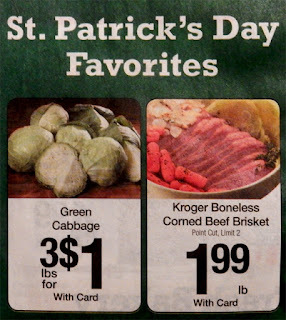 You can use any fruit you find on sale. I always find soy milk at the 99c only Stores, and every once in a while almond milk makes an appearance in the cold deli case. So hit the produce section of your grocery store or farmers market, and stock up on your favorite fresh fruit to slice and add to my cheap$kate Chia Pudding with Fruit. 3 cups soy milk - okay to use regular milk, almond milk or almost any juice. For thicker pudding use 2 or 2 1/2 cups of liquid. 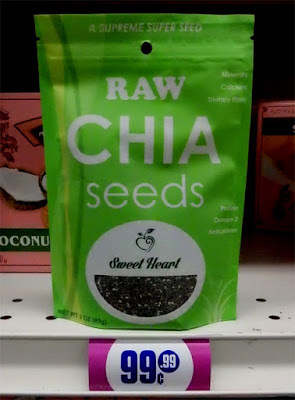 Raw Chia seeds - 3 ounces or half a cup. Fruit - any favorite. 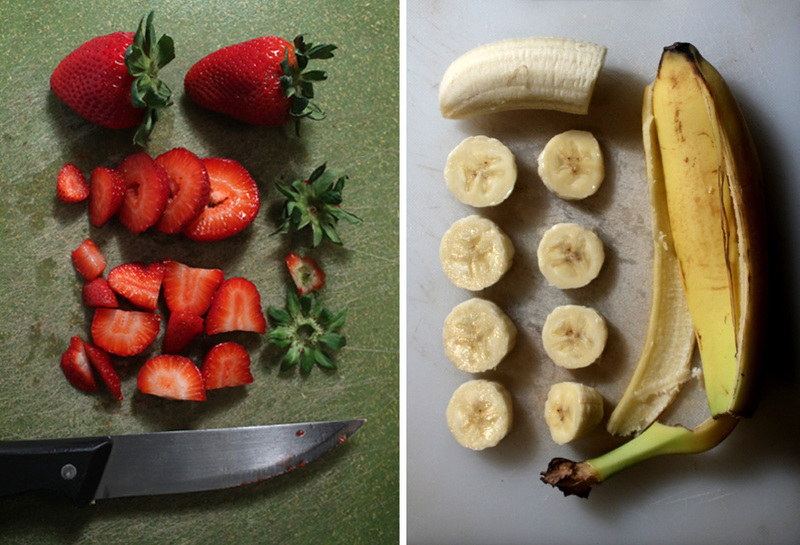 I used cheap bananas and strawberries. Add as much as you like. Other fruit to try: pineapple, peach, mango, melon, blueberries, or whatever you can find on sale at the grocery and farmers market. 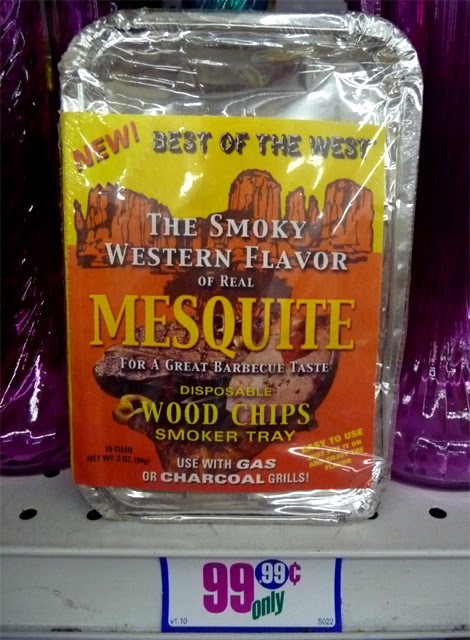 Okay to add teaspoon of any favorite sweetener - optional. 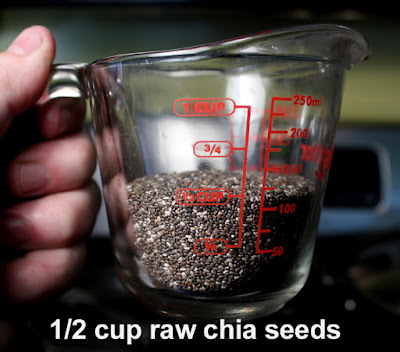 Add raw Chia seeds to a large bowl. Pour in 2 to 3 cups of soy milk, regular milk, almond milk, or fruit juice. 3 cups of soy milk will make an oatmeal or sour cream consistency. 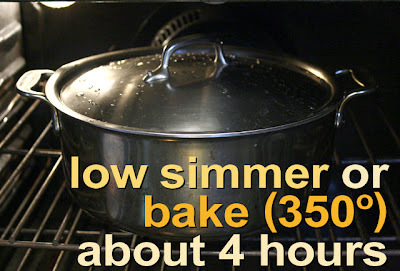 Okay to use about 2 cups of soy milk for a thicker pudding. 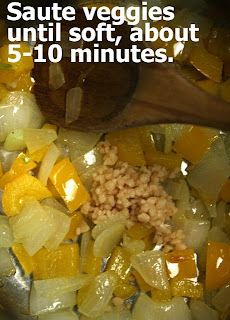 Stir seeds into soy milk and set in the refrigerator for 3 to 4 hours. 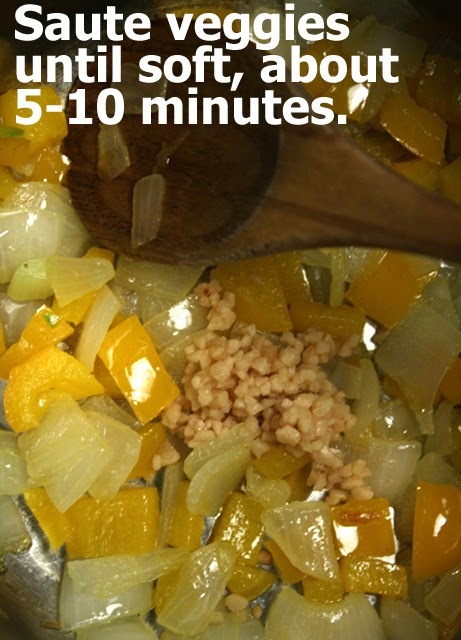 Stir mixture once every hour as seeds absorb liquid. They clump up some, but easily break apart with a light stir. When mixture is set, add Chia Pudding to a bowl and add sliced fruit - as much fruit as you like. 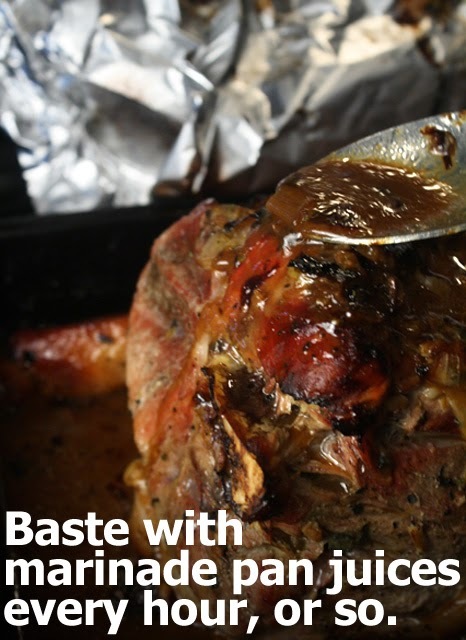 Some recipes call for a tablespoon of honey or any favorite sweetener. I find the fruit and soy milk sweet enough for my taste. For a single serving, add 3 tablespoons of raw Chia seeds and fill up a coffee mug with soy milk or favorite liquid. Standing before the Brandenburg Gate, West Berlin, in 1987, President Reagan exclaimed: “Mr. Gorbachev, tear down this wall." He was referring to the Communist-built barrier separating East and West Berlin, a bitter symbol of the Cold War. This month President Obama trumps Reagan by crossing into enemy territory to tear down our own misguided economic wall around our island neighbor. On Obama's second day of a historic visit to Cuba, in a speech addressed to the Cuban people, he declared: "I am here to bury the last remnants of the Cold War in the Americas." 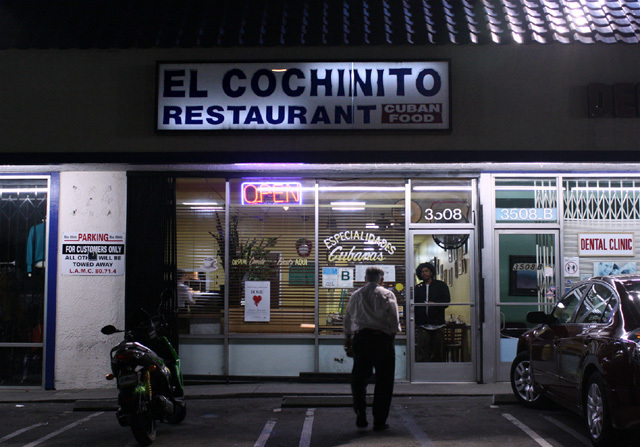 And now The 99 Cent Chef is ending the Cuban embargo, culinarily that is. So in support of President Obama's latest diplomatic coup d'état, I offer up a tasty slate of Cuban-style recipes as a yummy peacetime dividend. The 99 Cent Chef welcomes all nations into his kitchen anytime. I wish I could really end this embargo on Cuba with a wave of my whisk. Let's move on Congress, this Cold War policy fiasco is so last century -- it's over! Just let the Republican politicians of Cuban descent, embargo supporting Marco Rubio and Senator Ted Cruz, stew in their own juices and eat crow, as President Obama continues spreading good will, and mending fences, to our Latin neighbors. 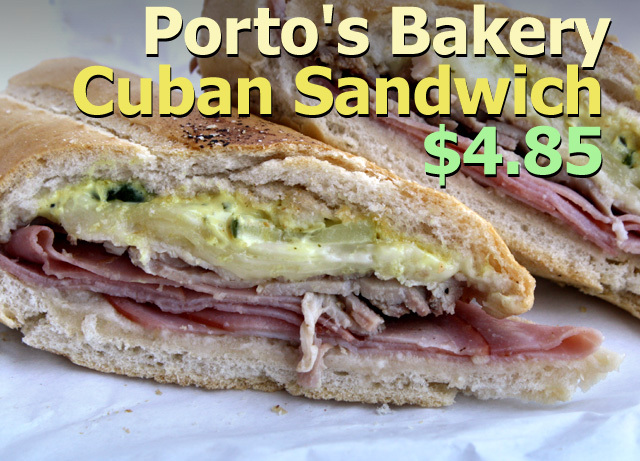 So let's start with one of my favorite sandwiches, a Cuban Sandwich. 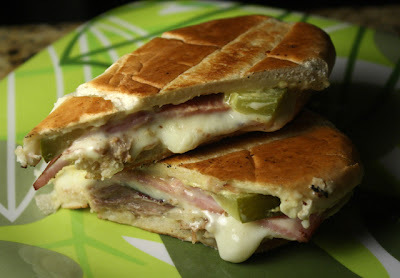 I would like to break bread with the Cuban people one day, as I am a great fan of their cuisine. 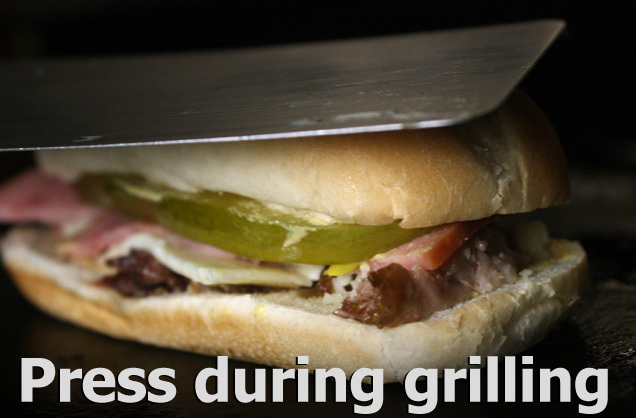 Locally I've had both good and bad Cuban Sandwiches. Downtown's former Cuidad (now a Border Grill ) served a great mini-version at Happy Hour to downtown power brokers in suits and skirts. At Glendale's Porto's Bakery on Brand Boulevard, nearby mall shoppers get a bargain sandwich deliciously meaty, and cheap at $4.85 (but they add mayo, which is a no-no.) At Cafe Tropical on Sunset Boulevard, Echo Park hipsters hunkered over their Macs, can scarf down $6 sandwiches while sipping papaya juice under Che Guevera posters. West on Sunset in Silverlake, taxi drivers dine mini-mall style at El Cochinito on $6.95 sandwiches. And my favorite Cuban Restaurant, Versailles , with locations on Venice and La Cienega Boulevards, serves a surprisingly unappetizing one for $9.99 - oily bread, ham, and Swiss cheese, with scraps of roast pork. 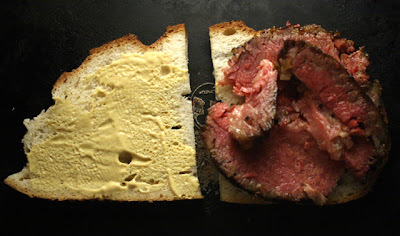 Maybe it was just a bad day in the kitchen the one and only time I tried it - I'll give it another chance some day. 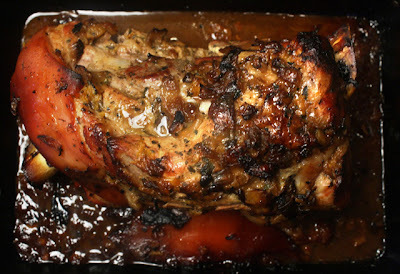 Sorry Versailles - I'll always come back for your Roast Pork and Chicken dinners, though. When placed on your plate it is a sleek modernist meal. The sandwich is pressed thin and sliced diagonally -- looking like a crisp, cheesy, meat-filled shark fin, with a slash of cool green pickle peeking out. 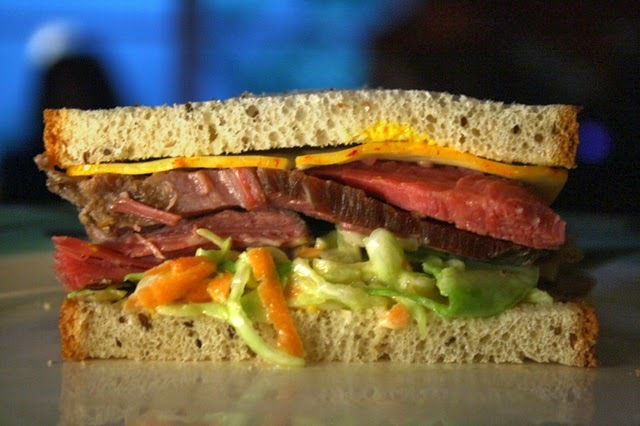 It's a great tasting sandwich that's also aesthetically pleasing. 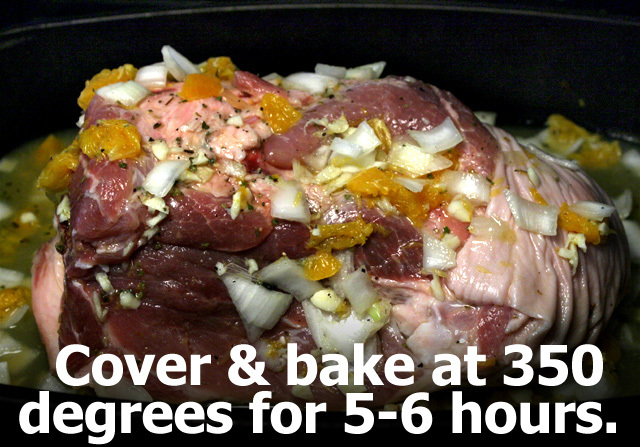 Skip ahead to get my recipe of Cuban Roast Pork the most complicated part of the sandwich. The other fillings come cheaply from a typical deli case. 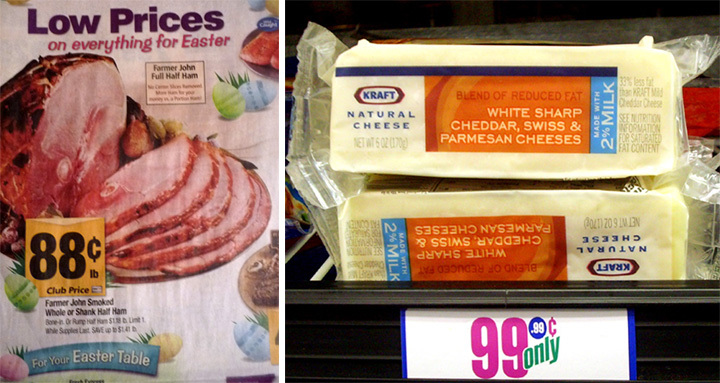 And you now have one more use for that leftover Easter ham. 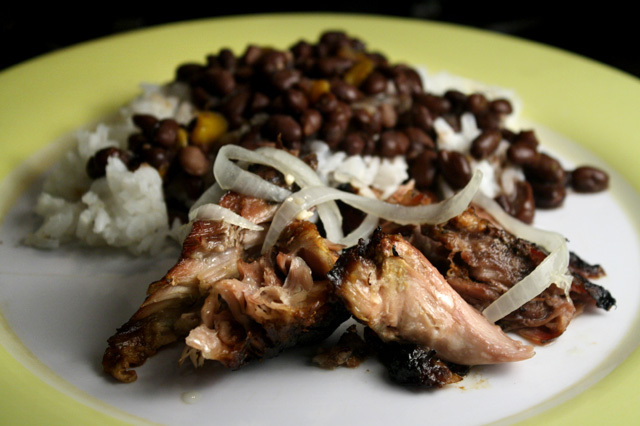 A classic Cuban meal involves Black Beans and White Rice. 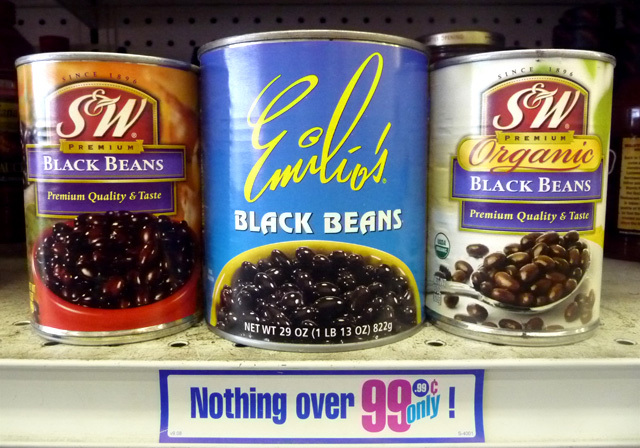 Read on for a quick Black Beans recipe. 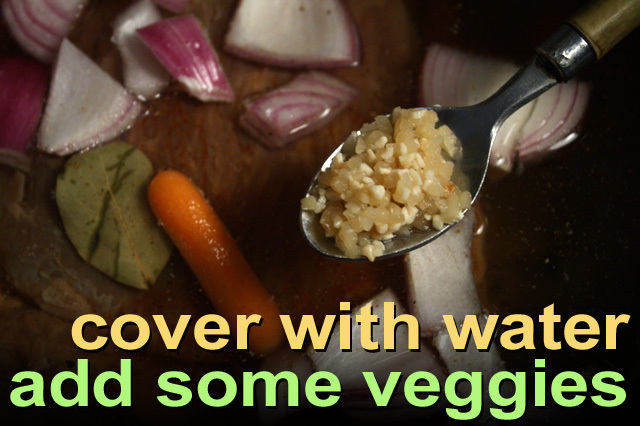 Everyone has made white rice (you can use generic quick-cooking.) I also did a favorite Cuban side of steamed Yucca a couple of years ago. For an extra rich sweet side try my Fried Plantains recipe that's described next. 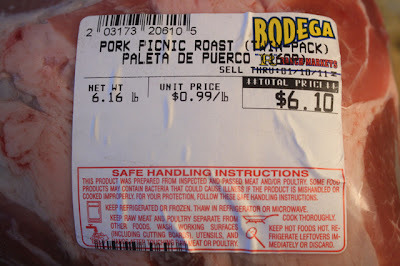 A healthier and less starchy way to go is to accompany roast pork with my Cuban Salad at the end of my Cuban themed blog post. 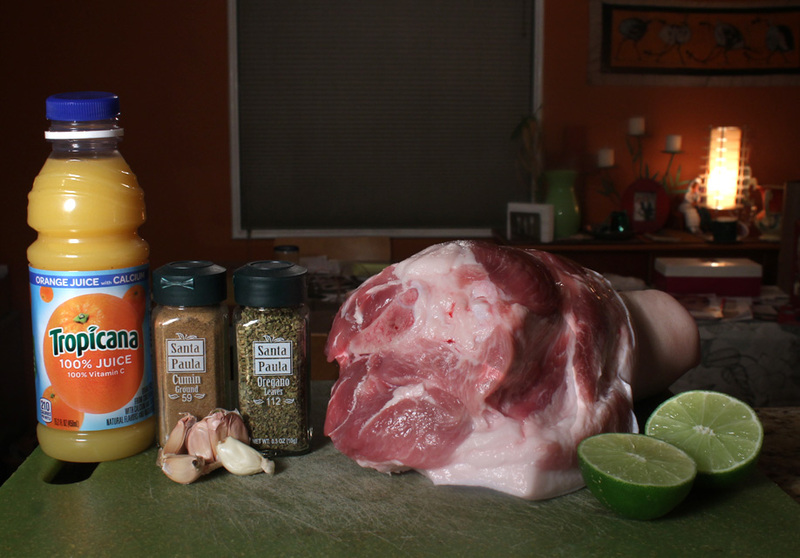 Cuban Roast Pork is the kind of dish you start baking after breakfast, so it's ready for dinner. 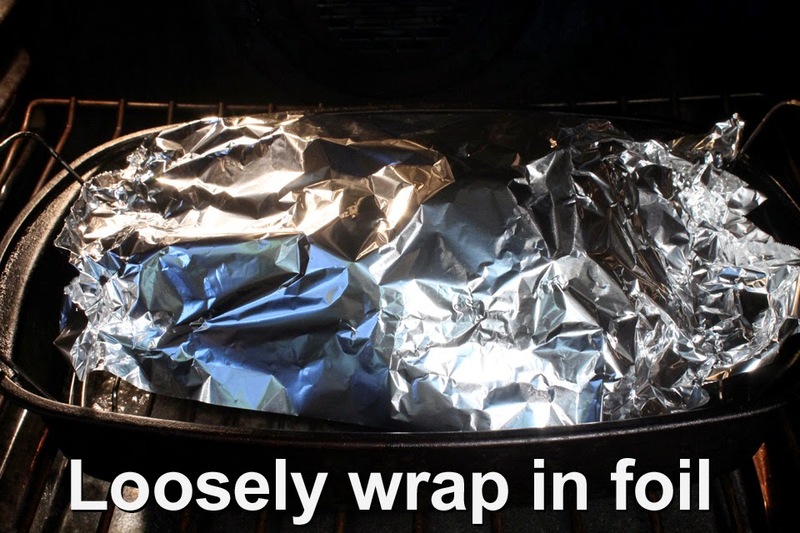 And since a large cut of meat is used, you will have plenty of leftovers for a couple of Cuban Sandwiches. 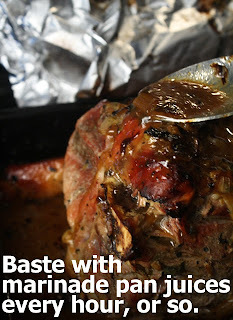 I've even cooked it for 8 hours for a large pork shoulder with bone. Just make sure there is water or broth in the roasting pan to keep the pork from drying out. 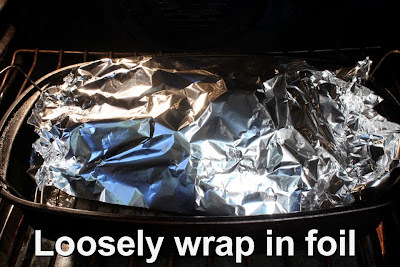 And keep it loosely coverrd in foil. Black is beautiful for the sweetest Fried Plantains. 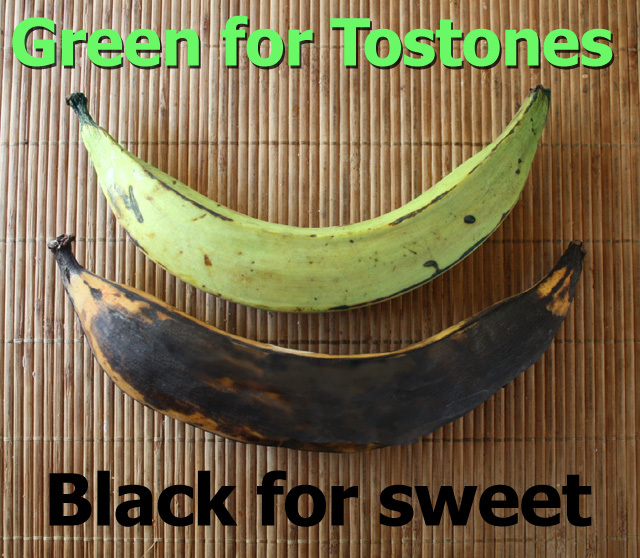 Green is the color for nutty, potato-like Tostones. When shopping for plantains keep this in mind. 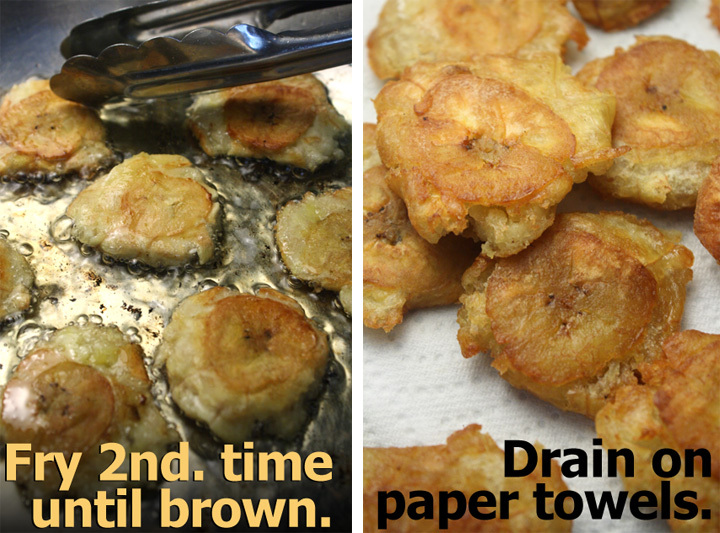 For my continuation of all things Cubano, I'll show you how to prepare both Fried Plantains and fried Tostones. It's an easy and quick dish to make; the only hard part is finding plantains. 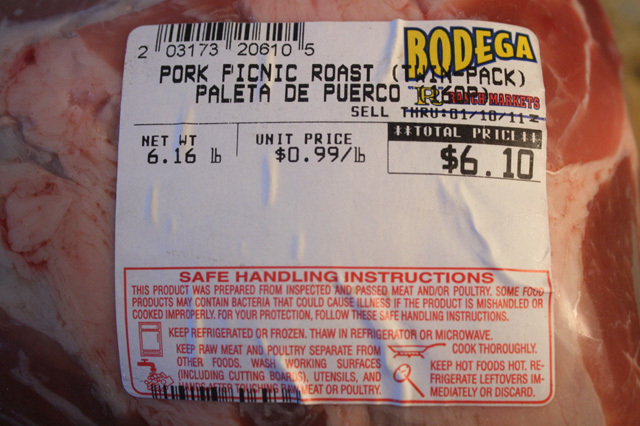 I go to my local Latin market where they sell for about 50 cents a pound, just the right price for this El Tightwad Cuisiner. 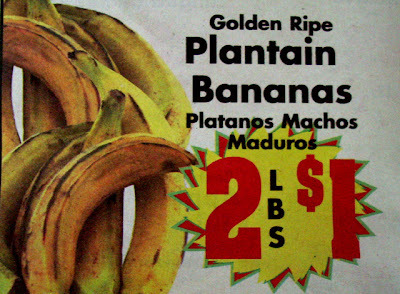 Since the majority of the Los Angeles populace is Latino, I find that plantains are carried in almost every large supermarket. 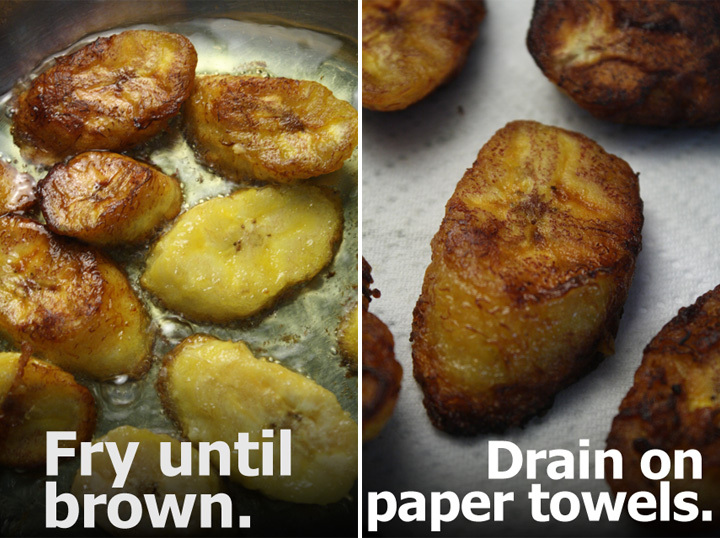 Like French fries, plantains are cooked in oil until brown. 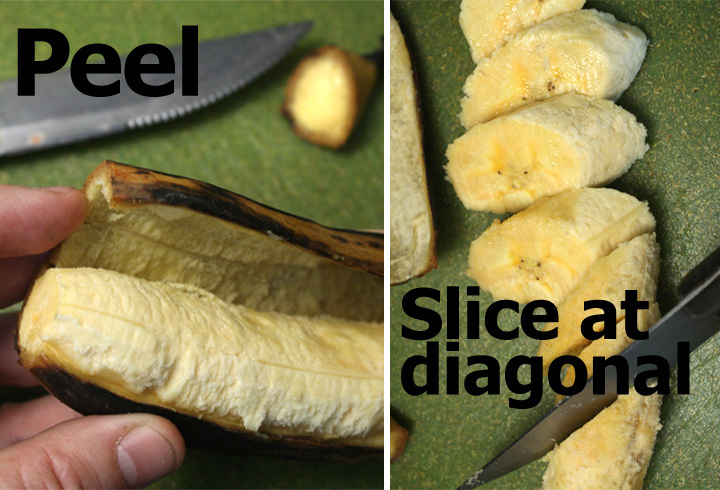 You do have to watch the ripened black plantains closely when cooking -- because of their high sugar content they can burn. Tostones don't have that, so they brown more slowly. Plantains are quite large, and just one makes enough for a couple of servings. 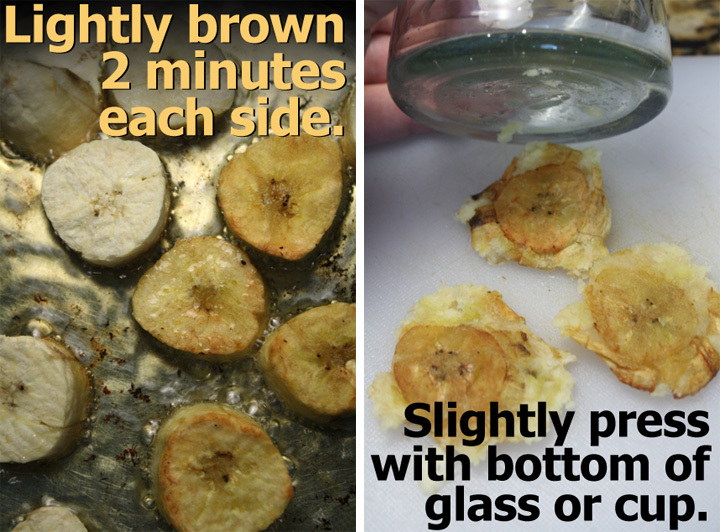 If you want a sweet Fried Plantain, buy it almost totally black. 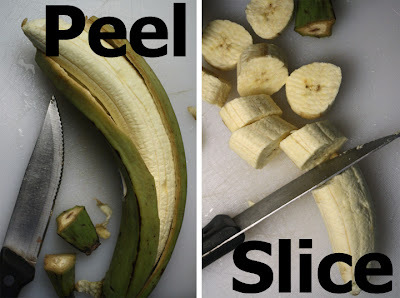 It is not rotten, just super sweet. If you get it yellow, you'll have to wait a few weeks to get the desired ripeness. In the photo, my plantain was not totally black, so the result was fine, but it could have been sweeter. 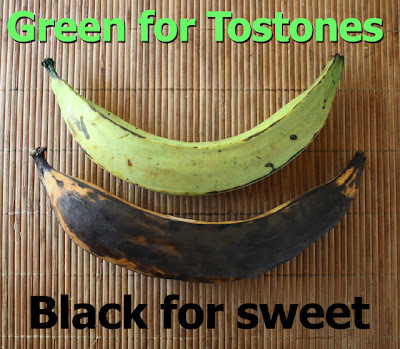 For Tostones, green is best, but I've used yellow, too. This is a perfect side for my Cuban Style Roast Pork. 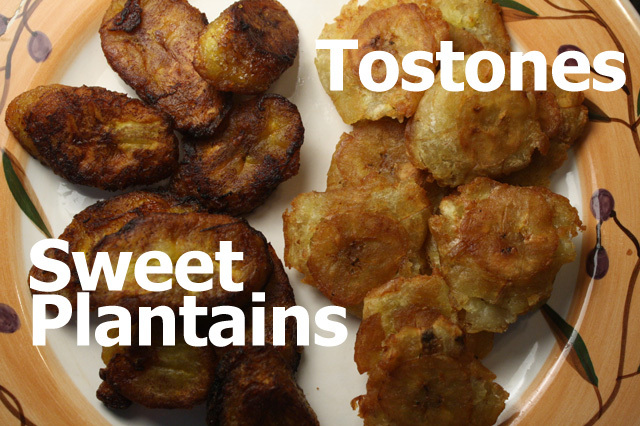 And Tostones double as tasty canapes that can be served like tortilla chips or crackers at a party. 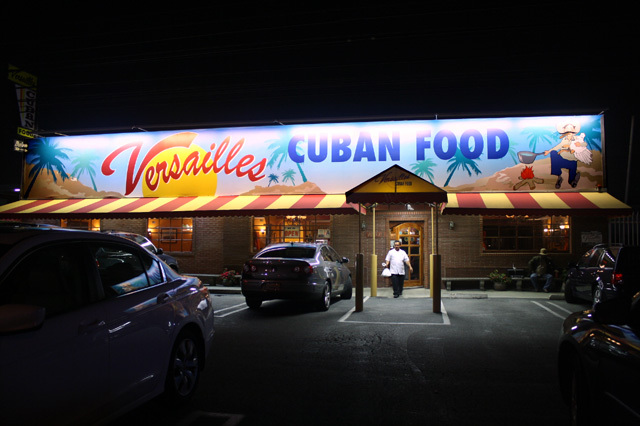 I first tried Cuban food at the venerable Versailles Restaurant on Venice Blvd. 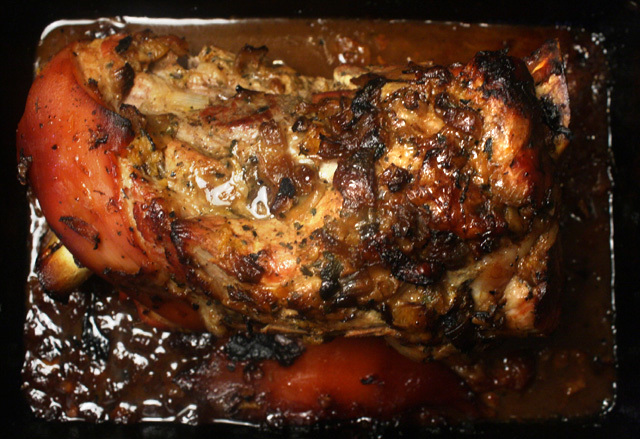 I love the place for its Roast Chicken and Roast Pork. 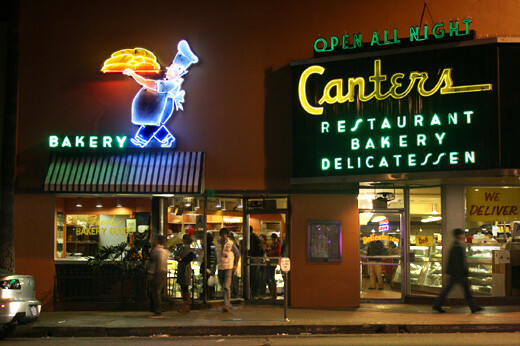 I think everyone in L.A. has eaten there at least once. 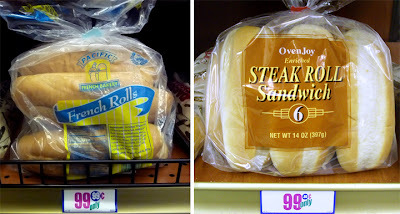 And the price is right, just over $12 for dinner, which includes black beans, white rice, fried plantains with a basket of delicious Cuban bread. 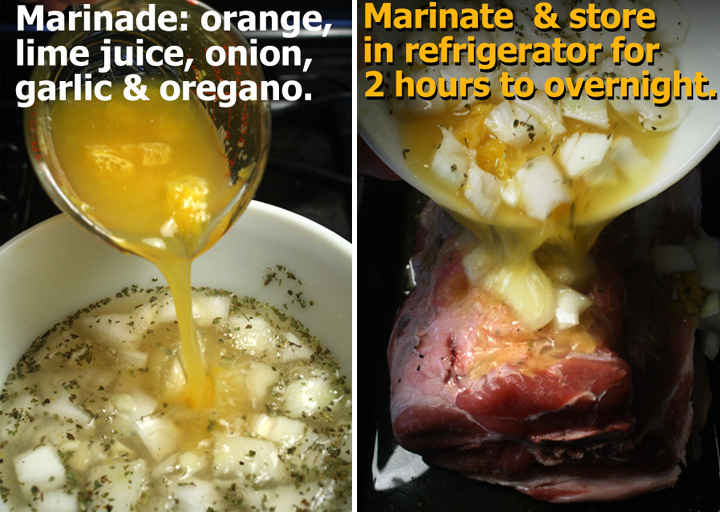 All you have to do is saute a little onion, bell pepper, garlic, 1/2 teaspoon of vinegar, and sprinkle in some oregano. 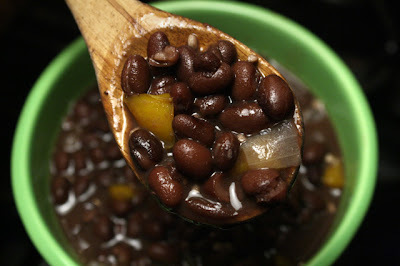 Mix it into a small pot of black beans and cook for 10 - 15 minutes. It's so simple, but makes a lot of difference. When I roast a hunk of pork, I'll put on a pot of black beans made from scratch (my recipe in under Hindsight below,) since they are both slow cooking. 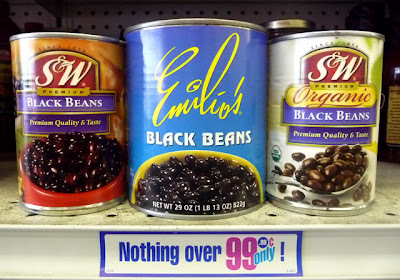 But most of the time I go with convenience and just use pre-cooked black beans. 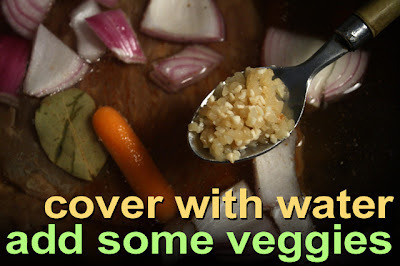 Next add the sauteed veggies, including some bacon grease, to the pot. For more flavor, you can substitute an equal amount of chicken or vegetable stock for a portion of the water when cooking beans. 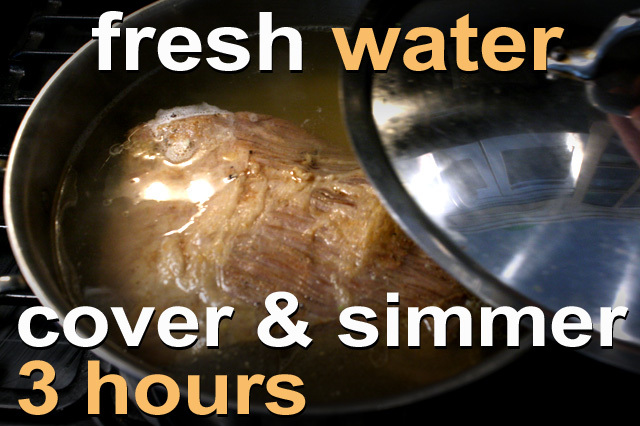 Low boil or simmer until beans are tender, about 3-4 hours. For shorter cooking time soak beans overnight before cooking - this will save you an hour of simmering. 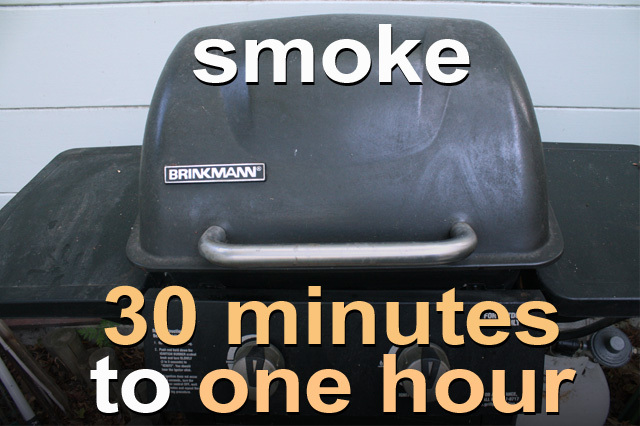 Check on beans every hour to make sure the liquid does not cook out. Add water or broth if needed. 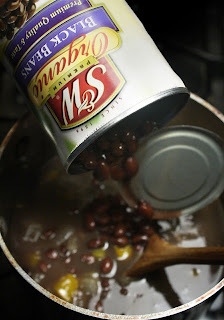 During the last hour of cooking, I uncover the pot so liquid cooks down and thickens slightly. 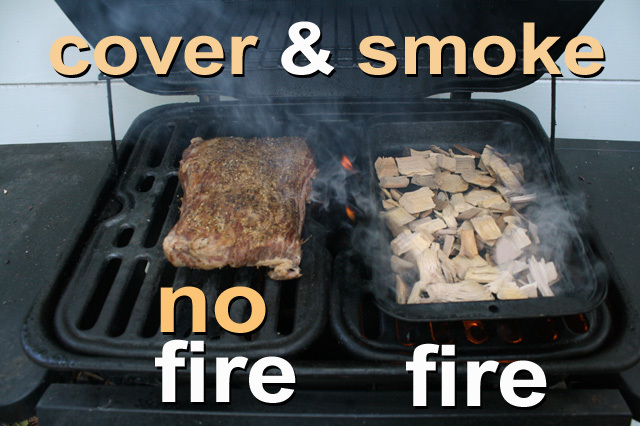 Check on the beans a few times to make sure water doesn't totally cook out. 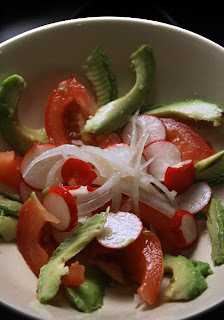 Crunchy radish, a tangy vinaigrette, and creamy avocado -- my Cuban Salad makes a light beginning to a typical meat and carb-heavy Cuban meal. 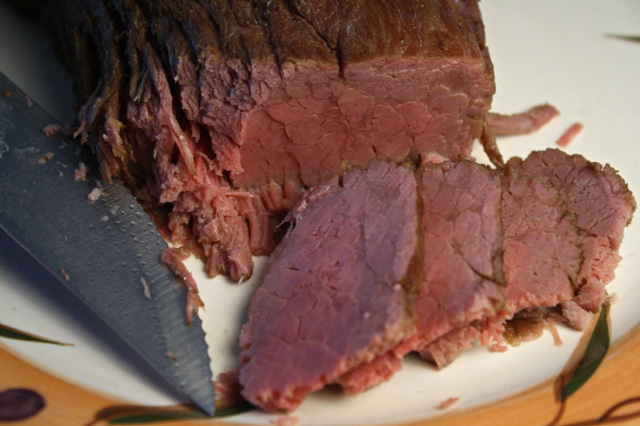 This salad goes perfectly with a Cuban Sandwich or Cuban Roasted Pork.